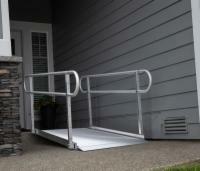 Solid ramps are designed to be used by scooters, electric wheelchairs, and manual wheelchairs. These lightweight ramps are ideal for temporary or semi-permanent indoor and outdoor use. Suitable for home or commercial accessibility, our solid ramps are an affordable alternative to more expensive means of clearing height obstructions with mobility devices.